Maybe you have some doubts about online learning. Is it really the best way to prepare yourself for transitioning into a civilian career? Let’s consider 10 questions you might well have about online learning and help you decide if they’re genuine reasons not to consider this educational option. Click on a specific question to jump straight to the discussion about it, or just scroll down to see all the questions answered. How Flexible is the Course Schedule? How do I Submit Course Assignments and Assessments? What Kind of Computer/Internet Access do I Need? Will I be Able to Keep Myself Motivated? How do I know it’s legit? Will I be successful without the structure of a classroom? 1. What Does the Online Classroom Look Like? Our philosophy for designing online courses: Use the latest technology to best deliver the content in the most flexible way while keeping the technology transparent to you. We use one centralized platform where you can log into your classroom. There you can access the materials get assignments, interact with your Course Advisor and peers, and more. 2. How Flexible is the Course Schedule? We designed our courses with your busy schedule in mind, providing the flexibility you need to study at the times most convenient to you. 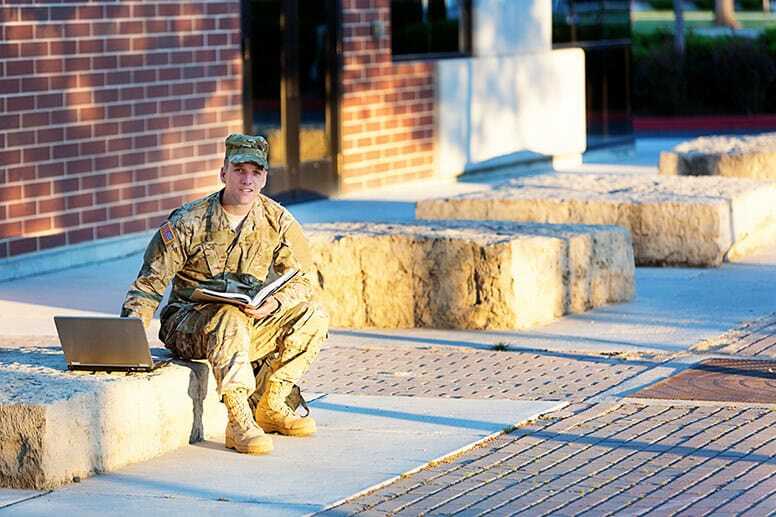 If you are suddenly deployed and need to take a break from your studies for a few months, that’s fine with us. Stay safe and pick up where you left off when your deployment finishes. This part-time study means that you can (and many people do) study around their current schedule of employment, family and social commitments. Do you want to study at 3 am on a Sunday morning? Sure – our online platform is always open! Do you want to study in 20-minute blocks during breaks? No worries – most of our lesson video are just 10-15 minutes long! Do you want to change your study pattern this one week because you’re visiting family at home? Of course – even if you normally study at a certain time, you’re always free to change that to suit your circumstance! None of these would be options with a classroom-based course. Whether you have the time or not, only you know. But in terms of flexibility, online learning is hard to beat. 3. What is the Time Commitment? Students enrolled in the Certificate in eBioPharma Validation course have reported spending approximately 12 to 16 hours per week on readings and assignments. Plan to spend extra time when you have papers, projects, or exams. 4. How Do I Submit Course Work and Take Exams? 5. What Kind of Computer/Internet Access Do I Need? A good and reliable broadband connection or 4G mobile connection. But it doesn’t have to be the quickest connection in the world, most standard internet connections will be sufficient. We try to make our courses as easy as possible to access technically while still maintaining a quality online experience. 6. Will I be Able to Keep Myself Motivated? Online courses can start off great, but staying motivated can be a challenge. New students start off extremely enthusiastic but after a few weeks, life starts to get in the way and an online course is usually one of the first things to get sidelined. You are the person in charge of your own success here – you need to keep your own motivations clear in your mind so you can keep prioritizing study when your initial enthusiasm subsides. On top of that, you will be assigned a Course Advisor when you enroll in our courses and that person will be with you through the whole process until you graduate. You’ll get regular feedback reports (and emails or phone calls if you fall behind!) to keep you on track. And your Course Advisor will be available via email or phone to discuss any queries you have about the course. They have stacks of information at their fingertips but if they don’t know the answer, they’ll know how to get it for you. 7. What Happens if I Fall Behind? Basically, we don’t let that happen. Some online courses just open their doors and leave you to get on with it – our courses are different. Our course content is released one week at a time so you will have regular ongoing contact with your Course Advisor and you shouldn’t ever feel overwhelmed by the tasks in front of you. We can see when you log in and when you complete assignments. We check this every week, for every trainee. If you start to fall behind, we notice and we WILL reach out. And if you’re someone who likes to take their time with education materials, online learning can be a great fit. You can take as long as you like within the week to complete the coursework, without worrying that you’re slowing down a classroom full of people. 8. What if I Don’t Understand Something? Typically, our students learn to critically think through a problem a few times to see if they can come up with the answer. They engage with classmates on the discussion forum (which is also monitored by lecturers) and use the internet to find additional resources. If you try that and still can’t come up with the answer, you can email your course advisor and get a thorough and direct response. 9. How do I Know this is Legit? We are an Irish/American company that grew out of an engineering consultancy, DPS Engineering. Our parent company has been designing and building pharmaceutical manufacturing plants for the world’s leading companies for over 40 years and we incorporate that real-world expertise into our courses to ensure that they are industry relevant, practical and give you the best chance of career success. We have been helping people make a mid-career change into the pharmaceutical and medical device manufacturing industries for almost 10 years – retraining over 3,200 people so far. Our graduates have gone on to work for the world’s leading blue-chip pharmaceutical and medical device manufacturing companies such as Pfizer, Johnson & Johnson, Novartis, Roche, GSK, Teva, Sanofi, Amgen, Abbott, Abbvie, Boston Scientific, Stryker, Mylan, Bristol-Myers Squibb (BMS), MSD, Merck Group, Gilead Sciences, Regeneron, Medtronic, GE Healthcare, Lilly, West Pharma, Jazz Pharmaceuticals, Zimmer Biomet, Becton Dickinson & Co and many more. We are supported by governments in both Ireland (through the Springboard Program) and in Singapore (via the WDA) – two of the world’s major pharmaceutical manufacturing hubs. 10. Will I be Successful Without the Structure of a Classroom? Firstly, there might not be a classroom but there is certainly structure and accountability. You’ll have regular check-ins with your course advisor who will make sure you’re keeping up to date with your coursework. They’ll also be able to offer advice and support if you have any difficulties with the programme. You’ll talk to the same person for the duration of your course so you’ll always have a familiar source of support. No parking fees, gas expenses or public transportation costs – surely there’s something else you could spend that money on! Spend time in the evening with your kids. Study after they have gone to bed. We know that transitioning into a civilian career is a big deal. And we know you don’t want to fail before you even get started. Our programs offer clear structure and accountability while maintaining flexibility with a weekly schedule to allow you to work at a pace and a time that suits you. And our staff and your Course Advisor are here to help you every step of the way.